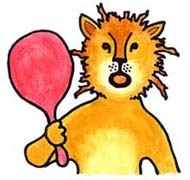 Pioneer Valley Educational Press publishes sets of books at different levels for beginning readers to use in a classroom setting. 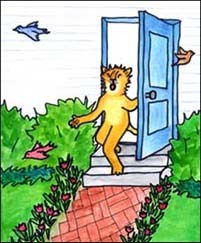 They chose me as their first illustrator -- their previous books (over 70 titles) were all illustrated with photographs -- and everyone who has seen my pictures has been crazy about them! Books can be ordered from PVEP. Note: All images are (c) copyright Pioneer Valley Educational Press. Other info: I show only a couple of illustrations from each book here -- along with the cover, which I designed, too -- there were 6-10 illustrations in each of the six books. The books are about 6x8 inches; the illustrations vary from smaller to full-page. I can put on my pajamas. I can brush my teeth. "Here," said the mouse. "Have a flower." "Let's go for a walk!" 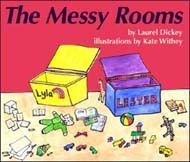 "Lyla, your room is all clean. Thank you!" Lester and Lyla got a new piano. 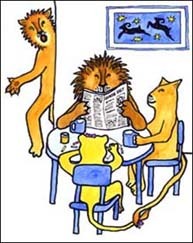 Poppa Lion played a song on the piano. 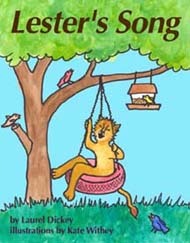 "I like that song," said Lester. "I want to play," said Lyla. He liked to sing in a very loud voice. Lester liked to sing a lot. ..."I'm going outside," he said. Lester went ouside to sing. When he began to sing all the birds flew away. Lester got very hot outside. "Your haircut is all done!" 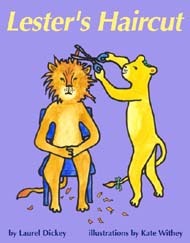 Lester looked at himself in the mirror.